Kids and books—they just go together. Children’s picture books are an addictive passion! You love reading to kids and wish that you could read one of your own. Now, you can make that dream a reality with this video course. Writing illustrated picture books for children can seem deceptively simple. You must tell a complete story in less than 1000 words, and less than 350 words is best. Characters grow and change and keep the reader emotionally invested, while also giving the illustrator great possibilities for the art. It’s a balancing act all the way around. Writing teacher and author of over a dozen children’s books Darcy Pattison explains the craft of writing children’s picture books. You’ll learn why format matters, how to appeal to kids and parents, how to write a read-aloud friendly book, and much more. Pattison provides tips on writing and editing your story. If you like detailed writing guides, plenty of contemporary examples, and practical worksheets, then you’ll love Darcy Pattison’s guidance on creating your own masterpiece that will fascinate generations of young readers. This video course includes over 32 video lessons. There are easy-to-follow slides that you can start and stop as you need. The course is open 24-7, so it fits your time schedule and life style. 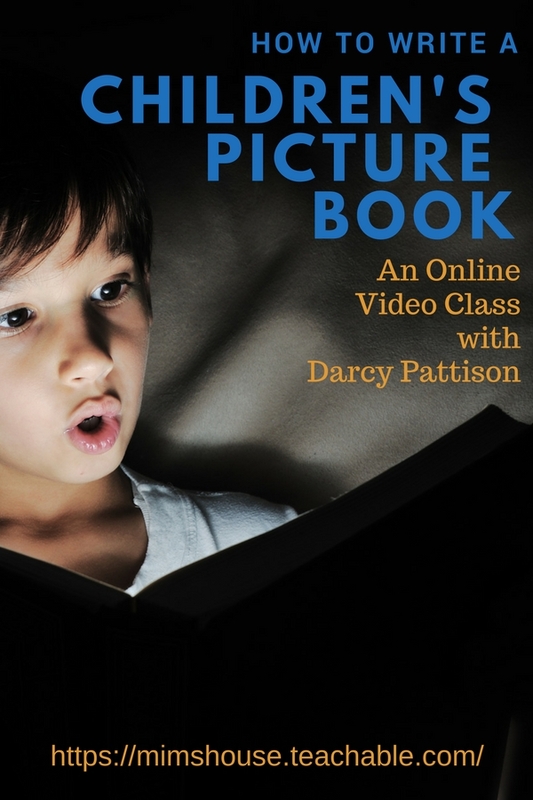 This video course is perfect for beginners or intermediate picture book writers. We'll cover the basics, but then move on to more exciting tips and techniques. You'll learn the basic structure of picture books, how to write a complete story in less than 500 words, and how to structure a story in multiple genres of picture books. You'll be challenged to read picture books published within the last 5 years so you develop a stronger sense of the market. Writing tasks take you from planning a story to editing it to the tight format required. You'll be confident that you can write a children's picture book of your own. You're thinking, "Picture books are so short. Anyone could do that!" I disagree. Writing short is hard! Picture books demand a full story in less than 500 words. That's only two typed-double spaced pages. My easy introduction to the writing section makes it easier than it should be! When I look for a writing teacher, I always want to know what they've published. Here are covers of my recent picture books, and a list of honors. I now have about 18 published picture books and it's a genre that I love to write. But it's hard! Because picture books are usually under 500 words, it's tight writing. My most common critique comments is, "Cut it in half!" That's why I decided to develop this course: I want to help you reach your dreams! When the Japanese tsunami struck on March 11, 2011, I was as heart-broken as everyone else. The next week, though, I heard the moving story of the survival of the oldest known wild bird in the world. Wisdom, a Laysan albatross lives and nests on Midway Island. When the tsunami struck, it sent out tidal waves in a circle. The waves hit Japan first with devastating results. But the waves also traveled east across the Pacific. The scientists who work on Midway Island knew the tsunami was coming. They took shelter in the third story of an old barracks building, the highest spot on the island. The tsunami struck at midnight. Scientists said that the scariest thing was that they could hear the water coming, but they couldn't see it. The next morning revealed the flooding and wreckage. Thousands of seabird chicks and adults were dead. When they though to look, Wisdom's nest was still there and her chick was safe. But Wisdom was missing. Ten days - and Wisdom had returned! Somehow, she had survived the tsunami and over 60 years of dangers from living wild and free. Within two months of the tsunami, I had the story written. I'm happy to say that book, WISDOM, THE MIDWAY ALBATROSS: Surviving the Japanese Tsunami and Other Disasters for Over 60 Years, received a starred review in Publisher's Weekly. This course if for you. So that you, too, can write the book of your dreams . . .
. . . and make it a reality! ENROLL now to start making YOUR dream come true!